This cake had strings of beads on it that were made using isomalt and gumpaste. 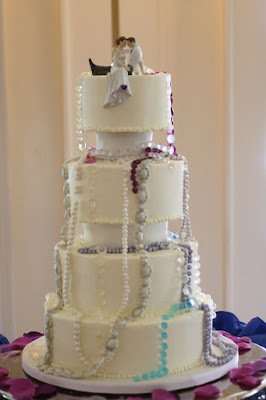 When you string beads to use as a suspended element on cakes the hard part isn't really stringing them, it's hanging them on the cake. If the cake is fondant it's one things, but the cake in the photo was buttercream, and it took me about an hour and a half to get the strands on without wrecking t he icing. I'll be posting about ways to suspend strands of beads on cakes next week...For now, here's a video on how to make strands of beads with isomalt.